If you’re passing below a thick tree canopy in peninsular India and happen to hear a scurrying above you, be sure to look up. You might catch a glimpse of a striking squirrel whose fur appears to have been hand-painted with splashes of brown, orange, maroon, and black. 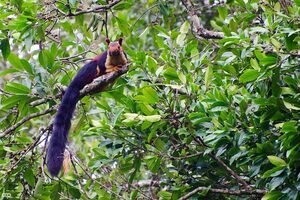 Meet the Malabar giant squirrel, which boasts an all-natural technicolor coat. Also known as shekru, these bright, bushy beauties, which are endemic to India, stretch as much as three feet long—much longer than the eastern gray squirrel and other less-fantastical counterparts. The patchwork fur may help the squirrels hide up in the sun-speckled canopy, which would be an advantage, because they spend most of their lives up there, scampering among the branches and nibbling on flowers, bark, seeds, insects, and bird eggs. Their feathery, charcoal-colored tails help them balance while they teeter on narrow branches or hang straight down to feast. High above the forest floor, they’re out of many predators’ reach—but if they are startled, though (say, by one of their winged predators, like the crested serpent eagle), they plop down flush against the branches, as though trying to melt into them. The cute critter is the state animal of Maharashtra—and if you’re setting out to spot some, your best bet will be in that region’s Bhimashankar Wildlife Sanctuary, tucked among the green, rolling Western Ghats mountain range. The site is also home to one of India’s 12 jyortirlingas, or shrines, dedicated to the god Shiva. Devotees often flock to the temple during monsoon season—an especially wild time to trek through hills tangled with dense, fog-cloaked forests, and dip a toe into the pools at the base of waterfalls. The sanctuary was established in the 1980s and has seen the squirrel population grow since. The animals have popped up on endangered species lists, but a census of the furry residents found that their numbers climbed by eight percent in the sanctuary between 2015 and 2016. Researchers surveyed squirrel nests in the nearby mango, coconut palm, and jamun trees and estimated that there were 2,145 individuals bedding down in the branches there. Each squirrel may build as many as eight nests; in 2017, the sanctuary’s census counts more than 22,000 of them. As an extra boost to the animal’s numbers in the wild, the Rajiv Gandhi Zoological Park and Research Centre launched a breeding effort in July 2018. Soon, there may be more of these colorful creatures than ever.